A Variety of Vinyl Banner Sizes: From the smallest 2×3 banner to a sizeable 6×10 and every standard dimension in between, your banner can be fitted to accommodate whatever your needs may be. Does the advertising space you’re looking at, or the design you want, require a unique fit? No worries! 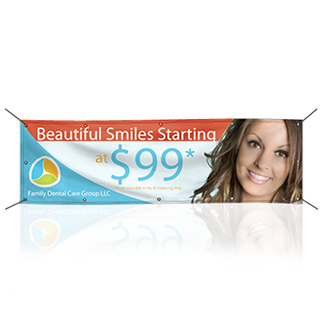 In addition to standard print sizes, we can create a custom-sized banner to meet your needs. Your Very Own Artwork on Display: If you’ve already created the design you want for your banner, we can work with that! To ensure a clean and professional look, our designers will be happy to help optimize your artwork of choice for prime advertising. Custom Banner Image Designs Created Just for You: We can also start from scratch and create a banner image that is custom-designed for your business. Our graphic designers seek to make eye-catching copy and pictures that will stand out and bring you the results you desire. We incorporate the same level of care in all of our design products at Avanti, so you may just find yourself looking into a brochure or catalog with similar designs. With all of these options available to you, we can create a banner that is the perfect fit. Got a tight deadline? We will work with you to make sure your banner is designed and printed within your timeframe without compromising the appeal of your design or product quality. We offer banner printing for companies in Irvine, Los Angeles, and throughout Orange County. Want to see samples of our previous work or get ideas? Stop by our facility to see and touch our designs — you deserve to know what you’ll get from us. We print our banners using high-quality vinyl scrim and ink. This sturdy material will hold up over many uses. You can place it outside your retail location without worry, as it’s durable enough to take on the elements. Many of our customers reuse their banners for the same events every year. Having a reusable vinyl banner you can pull out for events saves you time and money vs. having to print new banners over and over. We can accommodate nearly any request you have for your business. Our flexible design options allow you to upload your own artwork to include in your banner. If the file needs a little tweaking, we can clean it up to ensure it looks clean and professional. Don’t have artwork of your own? No problem. Our graphic designers can work with you to come up with images or copy that stand out on your banner. Flyers and postcards are great tools when it comes to small-scale event and business advertising, but sometimes you have to think much bigger and bolder to get people’s attention. That’s where outdoor vinyl banners can really work their magic. There is no better way to tell your story to the masses and attract new customers than a custom banner. Skyrocket your brand awareness by getting a banner printed with your company’s logo and an appealing design and displaying it in a heavily trafficked area. You’ll start having new customers walk through the door in no time! Are you marketing for a specific event or special offer? Directing people to a meeting place or advertising a new business location? A custom banner can help you get the word out quickly. And where’s the best place to get company vinyl banners made near Orange County? Look no further than your local marketing partner, Avanti Printing. Advertising New Developments: Without communicating your message loud and clear, how will the people know what you’re offering? Even corporate giants understand the advantages of using banners to advertise upcoming product launches, a change in location or a huge clearance sale, so the small business owner should never shy away from them when applicable. Considering their durability and affordability, you can have reusable banners for a yearly end-of-season promotion, and you can create newly updated signs as your information changes and count on your banners to draw in the necessary business. Marking Your Location Among Other Establishments: Similarly, if your business is located in a busy shopping mall or an area next to other companies, you can let shoppers know of your location by placing a well-designed banner in a highly visible position. The goal is to communicate where you are, who you are and what you have to offer, while also giving the consumer a clear picture of your brand’s overall appeal. Clarity is a smart goal in advertising, and marking your store location is a great way to craft a clear message. Drawing Attention at Crowded Events: Huge conventions and trade shows are excellent places to connect with new potential customers and get your name out there, but they can also be so heavily crowded that your business might run the risk of blending in or being missed entirely. Set yourself apart, and make sure approaching prospects remember you, by branding your booth with a sizeable vinyl banner communicating your message in an attractive, intriguing way. Doing so signals your location for interested consumers to return to and guarantees your name won’t be forgotten. Decor and Signage for Individual Use: Small organizations and individuals can also make use of banners. While your business may not need to display a banner for functions like weddings or birthday parties, it is useful to understand the many varied uses of banners in case there is a special event that you decide to host. Banners are portable and cost-efficient, easy to use for background displays or to announce a hearty celebration of an event, such as an employee’s retirement, a special company anniversary or a yearly office party that everyone eagerly anticipates. There are so many ways to kick your success up a notch by using banners at strategic events and locations. A vinyl banner gives you flexibility and enables creativity in your marketing, and it can offer other benefits that may just surprise you. Even in a world of social media and email marketing, banners are still one of the most useful advertising tools out there. They are portable, reusable, highly visible and durable and can serve multiple purposes. If you want to get your name out and in front of large numbers of people, a well-designed and strategically placed banner is the way to do it. Know the Type of Banner You Need and the Right Materials: On the market, there are all sorts of banner materials for you to choose from. Vinyl works exceptionally well in many areas, but other materials also have their perks. For example, a mesh banner can be highly effective in windy areas. There are other materials such as finishes and fasteners to consider. Banners with a matte finish rather than a glossy design might be better for extremely well-lit locations, and vinyl banners that come with grommets might work better than vinyl banners with pole pockets in different scenarios. Decide on a Strategic Location to Ensure Maximum Visibility:As with all marketing, location is everything. Across the front of your trade show exhibit or just inside the entrance to your store are prominent and highly visible locations for you to take advantage of. You may even consider paying the extra fees to display your banner outside your event venue to incur additional exposure and grab the attention of people passing by. Overall, your options for display are nearly limitless, but you will want to make sure it can be seen from various angles and distances. Create a Design to Evoke Brand Response: All advertising seeks to create a specific reaction, and banner marketing is no different. As a visual tool, use colors, slogans, and images that reinforce your brand and evoke the emotions that your business represents. You want your consumer to associate the feeling with your brand and product and to remember these feelings and your name down the line. Provide the Right Information to Reduce Confusion: Put yourself in your prospect’s shoes to see if your banner is providing enough details to orient and the right information to give an accurate picture of your brand and product. With space limitations, you will want to have one central message to communicate, and you will want to do so as clearly as possible. Rather than adorning your sign with technical or uncommon language, always opt for clarity and use easily understood words when possible. With all of these useful tips and precautions, you can make sure you reap all of the benefits of using vinyl banners for your advertising. The surface area of a well-designed banner is enough to provide a lot of branding information and set you apart from your competition. Banners are also often the sign of choice at sponsored events, so you can have to power to decide how your brand is represented by providing a suitable banner of your own. With all of the use you will get out of your banner, you will want to make sure you take care of it properly so you can use it over and over again, saving time and money down the line. How to Handle Your Banner for Lower Wear and Tear: Make sure all who handle your banner have clean hands, as even hand lotion can stain your vinyl or leave an oily residue that attracts grime. Using gloves when installing not only protects your banner from getting smudged, but it may also protect your hands from accidental rubbing or injury. How to Install Your Banner to Ensure Long-Term Good Condition: When your banner is outdoors and exposed to strong winds, you run the risk of stretching and strain that can fade your banner colors. For this reason, it is especially important to avoid stretching your banner when installing it. Consider tying your banner down with bungee cords to offer strength and just enough elasticity to remove some of the extra strain from your banner. How to Properly Store Your Banner When Not in Use: Before storing, make sure your vinyl banner is completely dry to prevent mold or mildew from damaging the material over time. That said, you want to only store your banner in a climate-controlled facility where you won’t have to worry about extreme temperatures causing wear. Roll your banner rather than fold it when it comes to storage. This will help prevent wrinkles, which can be a challenge to remove. How to Clean and Maintain Vinyl Materials: Even if you hang it indoors, your banner will likely get dusty and need cleaning eventually. Use a damp, non-abrasive cloth to gently wipe off smudges and dirt and avoid using cleaning products. Only use cold water to prevent fabric shrinking, and if you can use dry cleaning methods, such as lifting dust with masking tape, all the better. Cleaning your banner using the wrong techniques can result in deteriorating your ink or your banner material, so it’s important to follow these instructions as carefully as possible. How to Get Wrinkles Out of Your Vinyl Banner for Reuse: It’s essential never to apply heat sources directly to your vinyl banner, so if you notice wrinkles, there are a few strategic ways to get them out, but they may require some patience. Try hanging your banner in the sun to warm the fibers or using a low-temperature steamer or hair dryer on the non-printed side to try and remove the wrinkles. Consider testing your method of choice on a small corner or an inconspicuous area of your banner to make sure it won’t cause any permanent damage. Vinyl is a durable material, but some of its delicate care requirements may take some getting used to. Following these guidelines will help you make sure your banner is well taken care of and that it will last for long-term use. Nailing down the right care procedure will be well worth it in the long run and you’ll be able to enjoy the benefits of your banner for many events down the road. There is no better time to invest in your marketing through a custom-made vinyl banner for your business. And at Avanti, we are eager to help you get started. Feel free to stop by our facility to see samples of our previous work and collect some ideas for your banner design. Not only can you see what kind of look you may want to go for, but you can also touch and feel the vinyl materials to make sure it’s a good fit for you and your business needs. Get in touch with us today about your next banner idea and you’ll receive the speedy and exceptional service that you deserve. As your local marketing partner, we make your satisfaction our number-one priority. Let’s see how we can move forward and grow — together!